This mattress offers medium comfort. We offer four trusted mattress types and 11 comfort options. If you don't like your new mattress, we'll exchange it or simply take it back. Our private label Serene® foam mattress responds to the contours of your body to provide proper orthopedic support and personalized comfort. This ventilated, immediate response foam has a cradled feel that relieves pressure on your joints for less tossing and turning and isolates movement so you and your partner can both sleep undisturbed. Serene foam has microscopic air capsules which provide exceptional support and fast recovery with superior heat dissipation for a cooler sleep experience than traditional memory foam. It is low VOC, reduces partner disturbance and relieves pressure on your joints for less tossing and turning. With a feel that’s not too soft and not too firm, this safe mattress accommodates a wide range of comfort preferences and contains no flame-retardant chemicals. The low-profile design of our mattresses is a perfect fit for our modern platform beds, which have support slats that eliminate the need for a box spring. 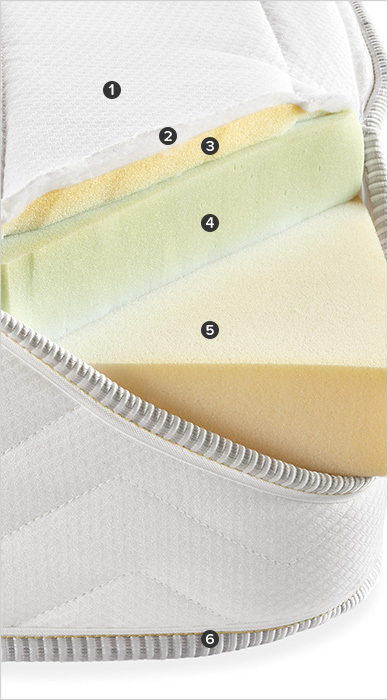 Each mattress is engineered for lasting comfort without the need to flip. Serene is a registered trademark of Carpenter Co.